At normal consistency, Prometheus copper clay does not stick to hands or plastic working surfaces. However, oiling your fingers and the working surface lightly is useful and would not harm your clay. Olive oil is preferable. Remove the clay from its plastic bag and place it on a clean plastic surface, teflex sheet or wax paper. Use your fingers, roller, spatulas, clay shapers, craft knives, tooth picks and other simple tools to shape it, texture it, or turn it on a potter's wheel. You can texture the clay with rubber stamps, texture mats, leaves, papers, and any other interesting textures. Keep the ''Wet Stage'' not too long, to avoid your clay from drying out, but don't rush your work; Prometheus copper clay gives you enough time to play with. However, if you detect any cracks on the surface, apply some water straight away with a brush or spray, and fill the cracks with a little paste(*) to repair them. Tip: (*)To make paste, mix a little clay with a little water until it is the consistency of thick yogurt. To join two wet pieces together, simply apply some water to the points that will touch, or a little paste. If the two pieces are dry, wet the touching points well and apply some paste to create a secure bond. Store any unused clay in a plastic bag with a zipper to prevent it from drying out. Place any offcuts in the bag straight away whilst you're working, and keep it closed. If you're not planning to work with the clay for a while, put the sealed plastic bag in a jar with a tight lid. Placing a wet sponge to the bottom of the jar will keep your clay at a good condition until your next usage. If you are storing it for a long time, keep an eye on the sponge and add water if needed. Before firing, you need to dry your piece completely. A hair dryer or putting it on top of a kiln will do it well. Hot-plates or food dehydrators also work well. To check if the clay is completely dried put it on a cold mirror while it is hot. After a few seconds, move it and check that there is no vapor on the mirror. This test is especially important for big and thick pieces. If the piece is not dried completely, it can crack, break or have bubbles on the surface while firing. We recommend large and/or massive pieces (statues etc.) to be left in room temperature for some time, and then continue drying at moderate temperatures, in order to avoid any cracks. (*)Draw your design with a pencil, wet the lines with a brush and make your carving with any instrument even a tooth-pick. (**) Most kilns are cooler near the front door, so put them close to the back of the heating chamber. (***) Be aware of water vapor. Place the dried piece (or pieces) on a stainless steel mesh and put it in to the pre-kiln at 500°C/ 932°F, or on a kitchen stove. Fire it for 10 minutes, take it on to a fire proof surface and let it cool down. Put approximately 3cm of activated carbon to the bottom of a steel container. Place the pieces with at least 1.5 cm space between each other and fill the container with activated carbon, close it and put it into the preheated kiln to 850°C / 1562°F. Let the kiln rise to the target temperature again and fire it for 90 minutes. When the firing is completed, either leave it to cool down in the kiln or carefully take it out and leave it on a heat isolated surface until it is cold enough to take your pieces out. One other firing schedule is 800°C / 1472°F for 2 hours which is preferable when Prometheus copper clay is combined with PBC®. Place the dried piece on a stainless steel mesh. Put the mesh on a fiber brick or a thick construction brick. Fire the piece homogenously at an orange-red color for 5-10 minutes according to the size of the piece. Avoid melting. After firing is completed, either leave it to cool down or quench in water. Leave the fired piece in hot Picklean® solution to get rid of any fire scale if any left. Brush your piece with a metal brush and, if necessary, put it in hot pickling solution. (*) After pickling, rinse the piece thoroughly with water and dry. This will give you a nice warm reddish copper color. You can also use many different patina solutions to give you other colors. Tip: (*)We recommend Picklean® granules. Mix one table spoon of Picklean® to a glass of hot water and leave your piece in it for some time. Polish the piece with a burnisher, polishing papers, a tumbler or polishing motor. Using polishing compounds can give extra shine to your works. Prometheus copper clay contains organic binder, water and copper powder. It is non-toxic, and does not contain any harmful chemicals. There have been no reports of allergic reactions; however, people with allergies should of course be sensible and use the product with care. Fire in a well ventilated place or under a kitchen extractor fan. Firing large pieces, like sculptures, is best done in a furnace with a smoke extractor. Wear gloves and safety glasses, use tongs, paddle when loading and unloading a kiln. 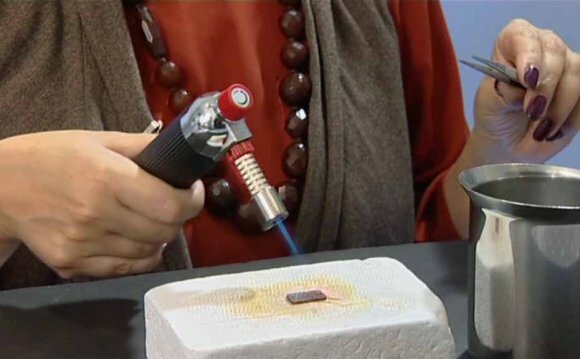 Put your hot pieces and tool on heat proof surfaces.